You know that it smells delicious, and makes the perfect addition to so many baked goods, but did you know that vanilla is also good for your skin? It’s true. Vanilla is a good source of essential oils, vitamins, and minerals, and especially B vitamins, and can help improve the look of your skin tone. It smells delicious, but it also can help protect your skin. Vanilla is actually quite exotic. A flavoring derived from a type of orchid called the flat-leaved vanilla plant, or V. planifolia, it’s native to Mexico, and was originally cultivated by the Totonac Indians. Later, the conquering Aztecs used it to make a tasty chocolate drink. When Hernando Cortez defeated the Aztecs, he is said to have taken the vanilla beans back to Europe, where for a time they were used only by the rich. In the early 1800s, the French started to grow the plant on tropical islands like Mauritius, Madagascar, Reunion Island and the Comoros Islands. Today, Madagascar is the largest producer of vanilla beans in the world, though Indonesia, Tahiti, Mexico, and India also produce the flavoring. The plant itself is a climbing vine, with orchid flowers, small and yellow-green, that after blooming, last only one day before wilting. While the flower is open, it can be pollinated, and then will produce one fruit—the long, green vanilla bean pod. Vanilla flowers are pollinated naturally by a specific species of bee found in Mexico, which originally limited the growing area to that country. In the 1800s, however, botanists discovered a way to hand-pollinate the flowers. The pod needs to remain on the vine for nine months to develop, and then the beans are harvested, cured, and dried to produce the extract. Vanilla not only tastes good, it’s good for you. It may help with nausea and upset stomach, and can help you relax. Vanilla was traditionally used to ignite passion it also has a high antioxidant content. We added vanilla powder to our Coconut Honey Mask mostly for its delicious scent, but you’ll enjoy the added benefits of the antioxidants as you sit back and let the product go to work. 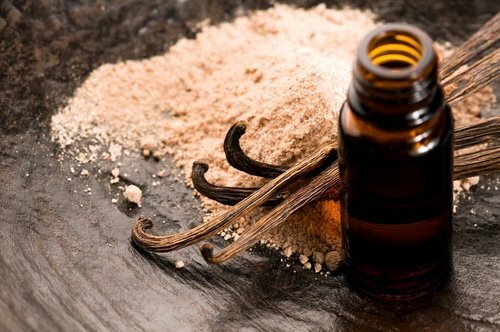 Do you have other insights into the benefits of vanilla? Please share them with us. Shyamala BN, et al., “Studies on the antioxidant activities of natural vanilla extract and its constituent compounds through in vitro models,” J Agric Food Chem, 2007 Sept 19;55(19):7738-43, http://www.ncbi.nlm.nih.gov/pubmed/17715988?dopt=AbstractPlus&holding=f1000,f1000m,isrctn.